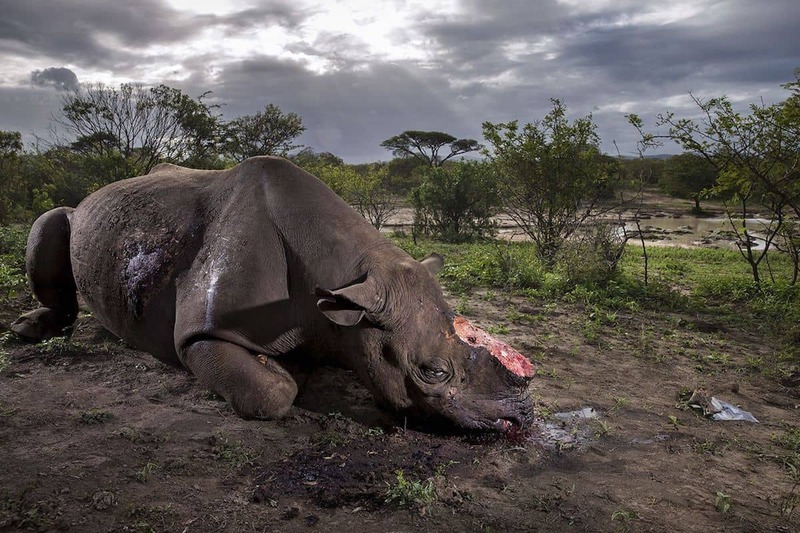 ‘Rhino Horn: The ongoing atrocity’ by Brent Stirton. 2017 Wildlife Photographer of the Year.Although the international trade in rhino horn was banned more than 40 years ago, horns still have a higher value on the black market than gold or cocaine. From the poorest of poachers to the richest of ranchers, this illegal trade is ultimately driven by human beliefs. The winners of the 2017 Wildlife Photographer of the Year Awards, run by the UK’s Natural History Museum, were selected for their artistic composition, technical innovation, and truthful interpretation of the natural world. Over numerous categories, adult and youth photographers used their cameras to weave a truthful, if sometimes painful, story about the state of contemporary wildlife. Brent Stirton was awarded the grand prize title of Wildlife Photographer of the Year for his story on the illegal rhino horn trade. With a population that has declined 90% since 1960, the endangered black rhino is still slaughtered commercially for its horn, even though this practice was banned more than 40 years ago. Stirton’s story shines an important light on this conservation issues. While his images can be shocking to see, it’s a necessary story to tell. Stirton, who also won the Wildlife Photojournalism Award: Story, beat out almost 50,000 entries with his winning image. The South African photographer followed the tale of a slaughtered black rhino in the Hluhluwe Imfolozi Game Reserve, a protected area. And though his work is often difficult, the photographer remarked that seeing the work of the other wildlife photographers gave him hope for the future. See more winning images below, and see the previously announced finalists across all categories. You can also vote for the People’s Choice Award until February 5, 2018 or visit the exhibition of 100 images from the competition at the Natural History Museum from October 20, 2017. The winners of the 2017 Wildlife Photographer of the Year Awards celebrate the beauty—and harsh reality—of the natural world. ‘The good life’ by Daniël Nelson. 2017 Youth Wildlife Photographer of the Year.Daniël met Caco after a three-hour trek through dense vegetation with skilled trackers. He was part of a family of 16 gorillas feeding on sweet African breadfruit. In his compelling portrait of this relaxed young gorilla, Daniël captured the inextricable connection of these wild apes with the forest on which they depend.The nine-year-old gorilla, Caco, is preparing to leave his family—putting on muscle and getting a little too bold. He will soon become a solitary silverback, hopefully starting his own family in eight to 10 years’ time. Western lowland gorillas are still critically endangered, threatened by illegal hunting and the spread of diseases like the Ebola virus. ‘Realm of the Seychelles’ by Thomas Peschak. The Wildlife Photographer Portfolio Award.Thomas’ sublime portfolio is a beautiful escape into the remote worlds of the Seychelles. His collection inspires an appreciation of the archipelago’s 115 islands and their flora and fauna—including the bohar snapper, one of the Aldabra Atoll’s top predators.Working with a group of scientists who were deploying BRUV (Baited Remote Underwater Video) systems, Thomas had to cling to the camera’s steel cables to get this compelling split-level shot. Using one hand to take pictures, the other attempted to repel the bold and inquisitive snappers—and their incredibly sharp teeth. ‘Contemplation’ by Peter Delaney. Winner, Animal Portraits.Peter had spent a long, difficult morning tracking chimpanzees through dense undergrowth. ‘Photographing in a rainforest with dim light and splashes of sunlight means your exposure settings are forever changing,’ he says. Keeping his camera at its optimum ISO setting meant a slow shutter speed, so it was hard to keep a sharp focus without a tripod.The troop of 250 chimpanzees had spent the morning high in the canopy. Totti, named after an Italian footballer, is a favorite with the rangers, but perhaps not the ladies. After trying everything to entice a female to join him on the ground—posturing, gesturing, and calling seductively—he gave up and flopped onto the forest floor. ‘Crab surprise’ by Justin Gilligan. Winner, Behavior, Invertebrates.Justin was busy documenting an artificial reef experiment when the army of crabs appeared, with an octopus acting ‘like an excited child in a candy store,’ as it chose its final catch. The irony of this unexpected encounter isn’t lost on Justin: ‘An aggregation of crabs the size of a football field wandered through the experiment and we had no idea why.’Moments like these reinforce how little we know about Australia’s temperate reefs, and ocean ecosystems generally. Spider crabs usually come together for protection while they molt or mate, but these groupings were previously unknown in this area. Crabs like these are common prey for the Maori octopus—the largest in Australian waters. ‘The night raider’ by Marcio Cabral. Winner, Animals in their Environment.Marcio had been visiting the National Park for three years waiting for the right conditions to capture the glowing termite mounds. After days frustrated by rain, he was in for a surprise. A giant anteater ambled out of the darkness and stayed just long enough for Marcio to take a single picture, using a long exposure and flash to highlight his unexpected companion.Termite mounds twinkle with the green lures of click beetle larvae, waiting for adult termites to fly into their traps. Giant anteaters, up to two meters long, have a more direct approach, using powerful claws and long tongues to reach inside the mound. But the termites aren’t defenseless—soldiers spray toxins at the intruder, which quickly make it move on. ‘Stuck in’ by Ashleigh Scully. Winner, 11–14 Years Old.Ashleigh was looking for red foxes in the deep snow of winter, having photographed them in spring and summer from a hide near her home. Spotting this female hunting from the back seat of a car, she grabbed her camera, rested it on the window frame and shot a series of the fox ‘mousing,’ diving nose first into a drift.Hunting foxes step quietly across the surface of the snow then stop, tilt their head and listen intently. Suddenly they will pounce, leaping high enough to punch through the deep snow. Sometimes they remain in this upside-down position for several seconds. More often than not these hunts are successful. The vole this fox was after was lucky this time. ‘Polar pas de deux’ by Eilo Elvinger. Winner, Black and White.Driven by curiosity and hunger, this polar bear and her cub stopped to investigate the dirty puddle leaking from Eilo’s ship. Without hesitation and in synchrony, they quickly lowered their heads to taste the stained snow. Ashamed, Eilo framed her shot in black and white, emphasizing the contrast between the pollution and the pristine environment.Year on year, a variety of noxious substances are brought into these bears’ habitats. Due to their low degradation rates, the pollutants remain in the environment, gradually accumulating as they make their way through the food web. As apex predators, the bears are exposed to high levels of these pollutants, which endanger their health and reproduction. ‘Palm-oil survivors’ by Aaron ‘Bertie’ Gekoski. Winner, The Wildlife Photojournalist Award: Single Image.Bertie looked on as a herd of Asian elephants picked their way through a cleared oil palm plantation. With the light fading fast he quickly shot the four majestic mammals, reflecting on how they ‘huddled together, dwarfed by a desolate and desecrated landscape.’In Sabah, the palm-oil trade is a main driver for deforestation. It destroys habitats, squeezing elephants out of the forest and into plantations. As reports of elephants being poisoned or shot by plantation workers become increasingly common, Asia must face one of its largest conservation challenges—mitigating human—elephant conflict. ‘Giant Gathering’ by Tony Wu. Winner, Behavior: Mammals.Dozens of sperm whales mingled noisily off the coast, stacked as far as Tony could see. Immediately, he realized that this was something special—like a gathering of clans, these whales were part of a multi-day congregation. For Tony, the sight filled him with hope that ‘the recovery of sperm whale populations may be going well.’The marble-like appearance of these whales is a sign of skin-sloughing. Large aggregations like this one will rub and roll against each other to exfoliate their neighbor’s dead skin, helping them to maintain hydrodynamic performance. 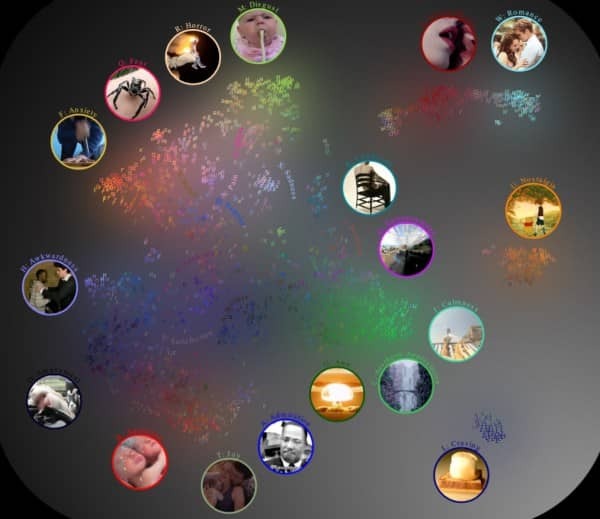 The tactile contact also helps to reinforce social bonds. ‘Tapestry of life’ by Dorin Bofan. Winner, Plants and Fungi.Dorin stood alone on the shores of the fjord contemplating the immense landscape as shafts of light warmed great walls of metamorphic rock. Drawn to the gentle curve at the base of one rock face—like the moss-covered trunk of a tree in an ancient wood—Dorin composed his picture of a timeless landscape reluctant to give up its scale.The mountains bounding Hamnøy rise steeply from the sea (a sheer drop of 650 feet in some places) yet they are flecked with the gold of mountain birches growing on their slopes, some clinging on in the most precipitous spots. These are a type of downy birch, a species that varies in habit and stature depending on where it grows. ‘The incubator bird’ by Gerry Pearce. Winner, Behavior: Birds.For four long months, this male brush turkey worked tirelessly to tend his nest mound. It was imperative that his eggs, buried deep under the rotting vegetation, were kept at 33°C. For Gerry, the turkey’s repetitive nature was an opportunity to experiment, enabling him to ‘come up with new and interesting ways’ to capture a ‘commonplace subject.’The brush turkey is one of a handful of birds, the megapodes, who incubate their eggs with heat generated from rotting vegetation. Using sensors in their upper bill, they constantly monitor the mound’s temperature. Too hot and they must remove leaf litter, too cool and (like this male) more insulation must be piled on. ‘The ice monster’ by Laurent Ballesta. Winner, Earth’s Environments.As soon as he saw the magnificent ice giant, Laurent craved to reveal its hidden depths. It took many hours to check out the location and prepare the shots but finally Laurent and his team were ready. Using a wide-angle lens they snapped 147 different images over three days. After careful stitching, the final image was assembled and ready to view.Trapped by the surrounding ice field, the iceberg floats safely above the sea floor. When free to roam, however, these icebergs can gouge great marks across the ocean bed as they are turned about by the wind, current and tide. The curves and curlicues of the scars leave a record of the past that scientists can use to study climate change. ‘The ancient ritual’ by Brian Skerry. Winner, Behavior: Amphibians and Reptiles.Like generations before her, this leatherback turtle journeys back to the ocean. Nesting turtles were not seen every night and were often too far away. When at last Brian got the encounter he wanted—under clear skies, with no distant city lights—he hand-held a long exposure under the full moon, artfully evoking a timeless atmosphere.Leatherbacks are the largest, fastest, deepest-diving and widest-ranging sea turtles. Much of their lives are spent at sea, shrouded in mystery. Sandy Point provides critical nesting habitat, but elsewhere, leatherbacks are not so lucky. They are threatened by fisheries, coastal development, and climate change. ‘The jellyfish jockey’ by Anthony Berberian. Winner, Under Water.Late at night, in the open ocean, Anthony dives in water more than 6,500 feet deep. His aim is to photograph tiny deep sea creatures that migrate to the surface under the cover of darkness to feed. Coming across this pair one night, it took many shots to get the right composition – a rare glimpse of these creatures in their natural surroundings.This phyllosoma, a lobster larva, is just a half-inch across. With a flattened body and eyes on stalks, its spindly legs grip the empty bell of a small dead jellyfish, a mauve stinger. When alive, this jellyfish glows in the dark and has a nasty sting. The little hitchhiker probably ate the jellyfish’s tentacles and now gets a free ride in the ocean current. The post 2017 Wildlife Photographer of the Year Winners Show the Beauty and Harsh Reality of the Natural World appeared first on My Modern Met.